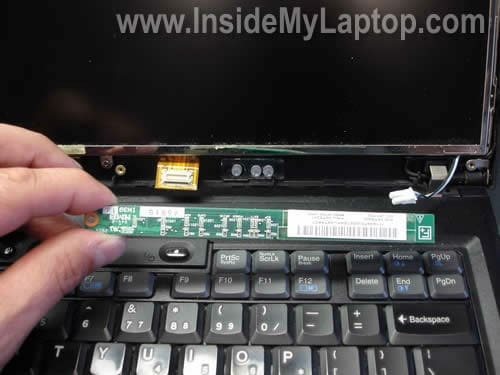 Today I will be removing and replacing the LCD screen in an IBM ThinkPad T43p laptop. 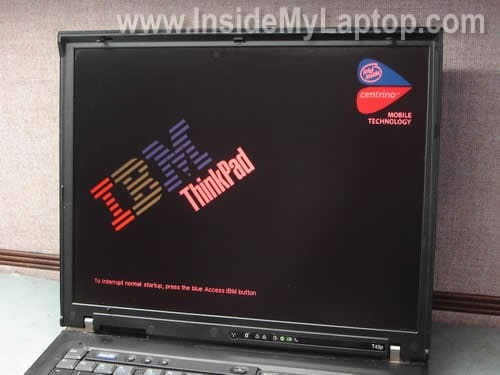 You can use these instructions for ThinkPad T43 and some other IBM (now Lenovo) models. 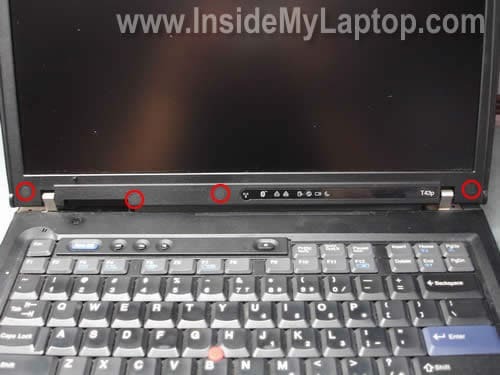 Failure description: the laptop starts with a reddish image (white color appear to be pink). After a minute or two the backlight goes completely off but you still can see a very faint image if you look very closely. When you restart the laptop, the screen lights up again but a minute later the light goes off. Solution: the screen has a failing backlight and it has to be replaced. Carefully remove four screw seals from the bottom part of the display bezel. You can remove them with a sharp object. Remove all four screws found under the seals. 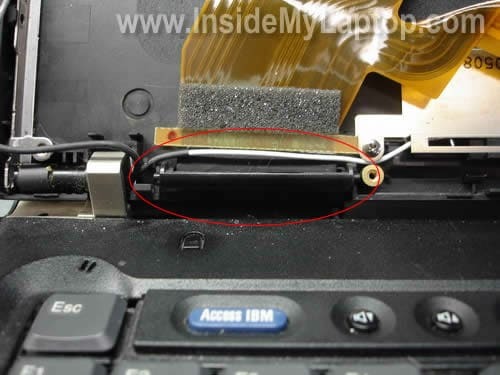 Remove three screws (found under seals) from the left side of the display panel. 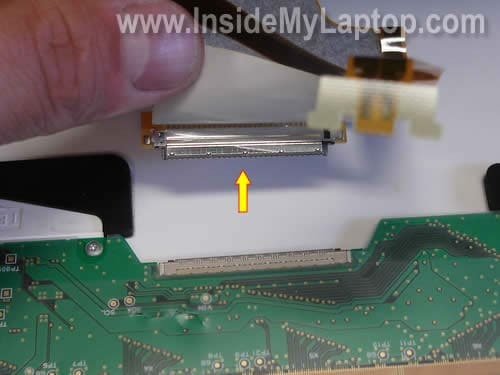 Remove four screws (found under seals) from the right side of the display panel. 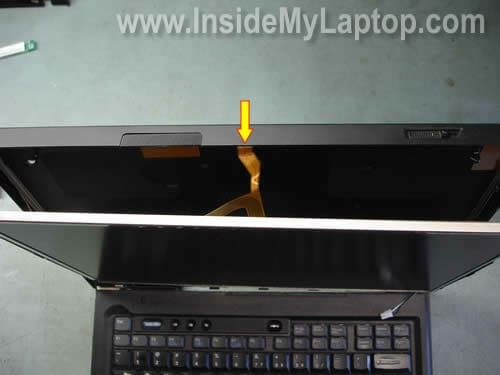 The display bezel is glued to the screen with sticky tape. You can separate the bezel using a guitar pick (as I do) or another piece of plastic. Insert the guitar pick under the bezel and carefully move it along the side until the bezel is separated. Continue removing the display bezel with your fingers. The inverter is mounted under the bezel and can be replaced without removing the bezel completely. I’ll remove the display bezel because I have to replace the screen. In order to confirm the backlight lamp failure I did the following experiment. I unplugged the LCD from the right side of the inverter board and plugged in an known good backlight lamp. After that I turned on the laptop and tested it with my backlight lamp for about 10 minutes. My backlight lamp didn’t turn off and worked fine all time. That means the backlight lamp inside the LCD is bad. 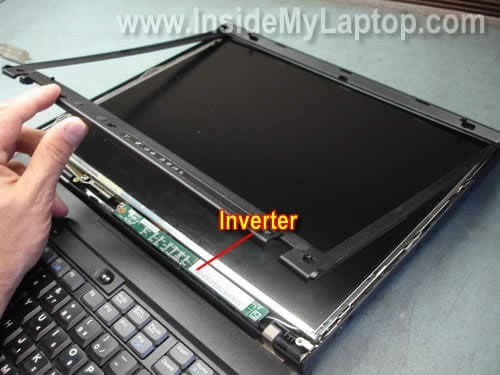 If your laptop doesn’t work with a known good backlight lamp, most likely you have a problem with the inverter board. Unplug the inverter board from the video cable. Carefully separate the LCD from the display cover. Do not forget to release the night lamp cable. Simply pull the cable from the display cover. Now you can access the back side and unplug the display cable. Remove sticky tape securing the connection and pull the cable from the connector. Be careful with this piece of plastic. Try not to remove it from the display because it will take some time to figure out how to connect it back together. I believe this piece of plastic is designed to prevent the cable from breaking when you close the display. Remove two screws securing the display mounting brackets. 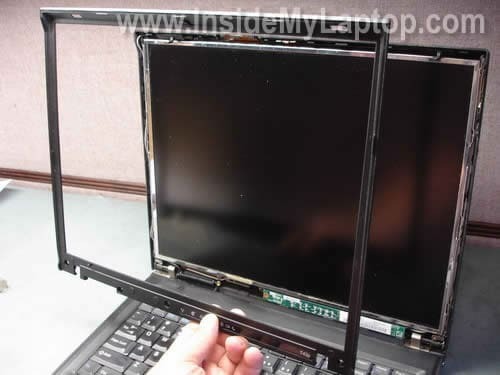 Remove the bracket and move it to a new screen. Do the same with the bracket on the other side. 2. FRU part number. In my case it is 92P6753. You can just replace the backlight instead of the whole LCD screen. Replacing the whole screen is lot easier for most people, but will save you lot’s of money if you just replace the backlight. I agree. Replacing just the backligth lamp will save you lot’s of money but you have to know what you are doing. 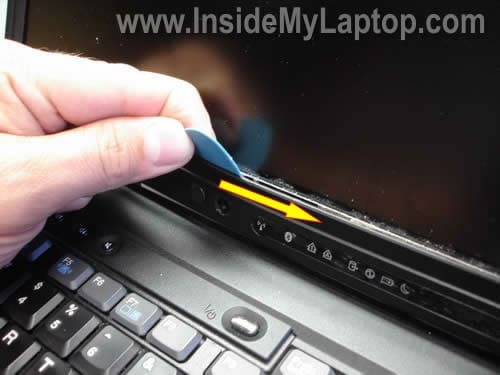 If you’ve never done it before you can easily damage the screen. Do it only if you have nothing to lose. You can find a new backlight lamp for about $10-15 on eBay. Great photo instructions – thanks. I just replaced my shattered T43 screen and it helped knowing what I was in for. 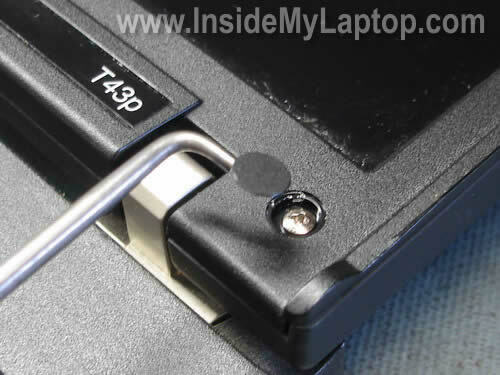 But a word of caution, even within the T43 series, there are screws in different places. I had two on the front bezel top (near the light), but only three on the bottom of the front bezel. Everyone should look closely for the black screw head covers so that you don’t overlook a screw. 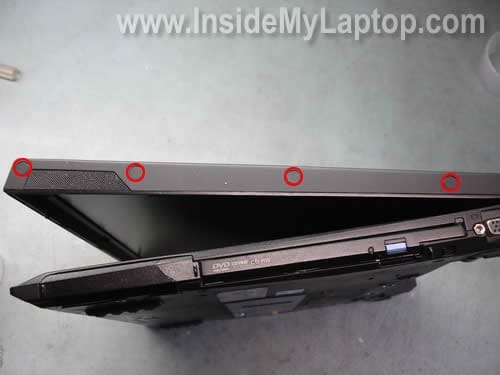 Otherwise you might crack the front bezel (or other plastic part) if you try to remove without a hidden screw still in place. 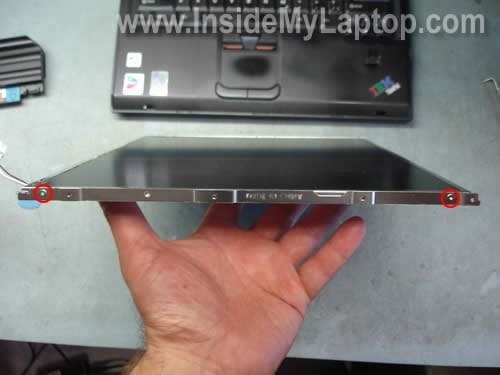 I have T43p with 14″ SXGA Samsung 1400×1050 screen (FRU 92P6760). I did replace ONLY old lcd panel with new one, all cables, screen box, and other things have not been remmoved, all are left from previous screen. automatically. I can NOT turn on notebook again before I remove baterry and put it back again. and no matter picture was pitch black on notebook, I could still get picture on my TV (connected via S-video cable to notebook). What went wrong, any ideas? Is something fried (motherboard maybe?) or what? Take a look at the parts list again. SXGA and XGA screens require different video cables. It’s possible that using a wrong screen with the original cable damaged the motherboard. 2. Remove AC adapter and battery. 3. Disconnect video cable from the LCD screen. Do not connect any screen. Wait for a while and try turning it on with the external monitor. Can you get external video after that? If yes, connect all back together and install the original screen. Test again. If it works, try replacing the video cable and only after that installing the new XGA screen. 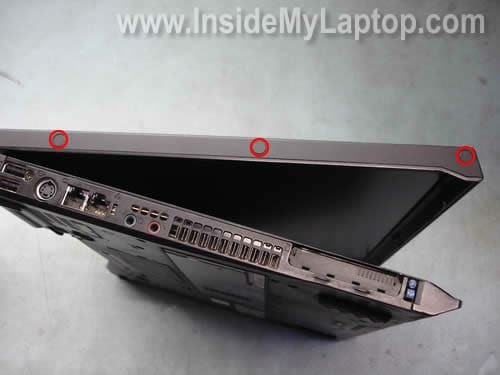 If the laptop still shuts down and will not stay on, it’s possible that you damaged the motherboard. Notebook works ok with external monitor. immediatelly 3-5 seconds after I press power button. Same thing also happens with XGA screen from T42. So, is motherboard damaged, how can I determine that? Do you have any more clues after I provided to you with this info? 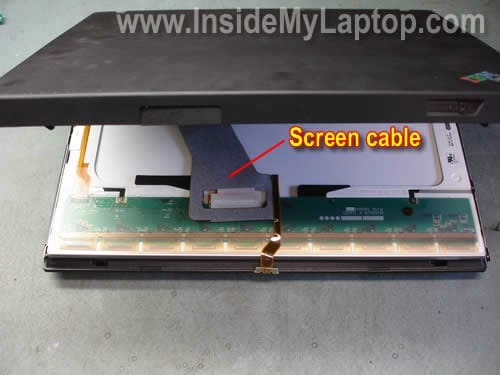 If i can be sure motherboard is not damaged I would by a new screen, however, if i cant determine if motherboard is damaged it would be too risky to buy a new screen. 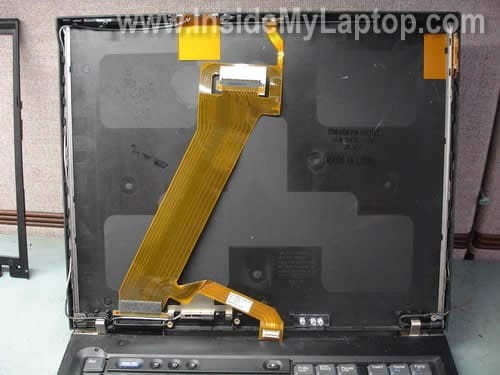 Unfortunately, there is no way to tell what is wrong without testing the laptop with another KNOWN GOOD SCREEN. It’s possible that when you installed a “wrong” XGA screen you damaged something on the motherboard OR maybe fried the video cable. I just want to really thank you. I was looking for about 2 hours on how to find the panel model number for my screen and you really helped me out. Thanks for such a great posting. 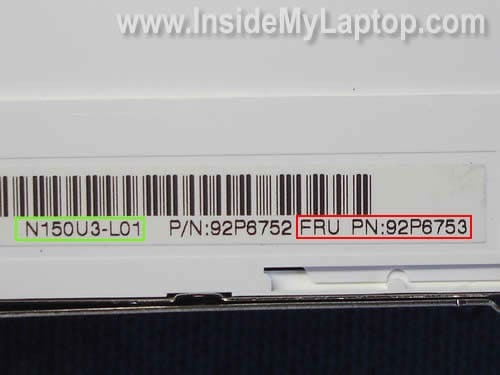 I just replaced my LCD screen on my t43p and everything was exactly as shown in the pictures, even the screen model number and FRU part number were identical. New screen works great. I was worried as I had no way of knowing if it was the screen back light or the inverter that was bad, but the way the symptoms were described (with the pink colors) fit what I was seeing so I took the chance. My screen had actually completely died (no light at all, even when first started up) but it had shown the pink color symptoms for a while before it died. It still worked fine on an external monitor though. The full replacement took less than an hour. right now my t43p’s screen goes out regularly, every 2-5minutes. sometimes i see something faint in the background, more likely if i have white-colored windows opened when it happens. but most of the time i see nothing at all back there. and my usually white letters aren’t reddish or pinkish at all. i can’t figure it out. i’ve gone through BIOS tweaks, multiple scans for malware, going through settings, but nothing so far, and it’s been almost 4 days of constant approaches. can anyone help me out with this? please do if you can :o) thanks! Most likely this is inverter failure or CCFL failure (backlight lamp inside the screen). 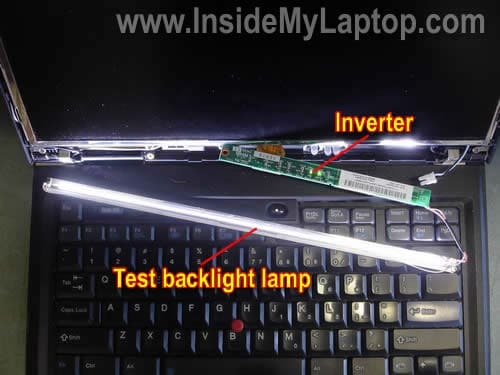 Cannot tell without testing the laptop with another inverter or lamp. If you have to guess, try replacing the inverter board first. There is a good chance you’ll fix the problem. These are a great set of instructions. I have two T43’s. The screen on one went black. Anyway, while replacing the LCD I have managed to damage the LCD connecter cable and now need some advice on how to replace the cable. At the moment I have one machine that I can cannabalise. I would appreciate some similar set of instructions as above. Info was very helpfull, thanks! 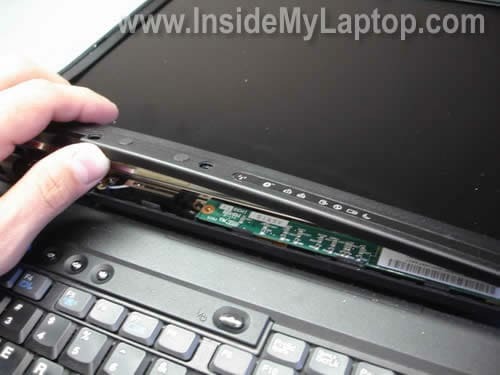 I’ve searched a number of sites for different laptop repair/disassembly manuals and while I’ve found a few this is by far the most comprehensive. Thanks for the post and thanks for your efforts.